Brian (Basil) Bunker – A Tribute. 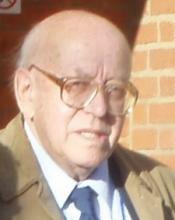 I am really sad to learn that my former teacher and form tutor, Brian Bunker, passed away earlier this year. At Carshalton High School For Boys, Mr. Bunker was notorious for his great eccentricity and had multiple idiosyncrasies that made him simply unforgettable; to most boys at school, he was ‘Basil Bunker The Biscuit Cruncher’ due to his almost hollistic dependancy on Lincoln biscuits and his belief that they helped his dodgy stomach. He often poked and proded his stomach when he was talking to you. To me, Mr. Bunker was the last bastion of school teachers who believed in strict discipline and commanded respect whilst in the classroom; indeed, he was like a living relic from a different age of schooling, the old schoolmasters who believed in caning unruly oiks and grabbing rude pupils by the scruff of the neck. Basil Bunker, as he preferred to be known, mainly taught English and History, but often gave us random lessons in Latin; even though I went to a scabby old secondary modern school and Latin wasn’t on the curriculum. He was one of the only people I ever willingly addressed as Sir and I absolutely idolised him because he would spend so much time mentoring me with my studies and I eventually came to consider him a good friend and confident; I will never forget how much he lectured me in Wallington High Street one afternoon when I bumped into him, he was disgusted that I’d pursued a Business Studies degree rather than English Literature. Given the existence of my blog and my love of writing, I have come to the conclusion that he was right and my decision to ignore his recommendation of doing an English degree remains one of the few regrets that I have in life. That said, it’s never too late! Maybe I’ll do him proud one day!?! I shall remember him for many reasons (how I cursed him during cross country! ), but most of all for being the man who inspired me more than any other during my academic years. This entry was posted in Kevs Anti-Rants and tagged basil, biscuit cruncher, brian, Bunker, carshalton high school for boys, cross country, English, History, teacher on November 24, 2015 by Kevin.